Without our bones, humans would be mounds of muscles and skin. Bones are essential to maintain our overall structure and support the rest of our body. However, most likely the most important collection of bones in our body is our spine. Without it, we would have no stabilizing force propping us up. Sometimes it can be easy to fall into bad habits that affects our spine as well as the muscles of our backs. Our backs aren’t a part of the body we pay attention to, however, the moment we feel pain in these areas, we immediately notice. Due to the fact that back pain and spine misalignment can have such severe ramifications, it stands to reason that we would take the best care of our backs, right? Well, unfortunately, a lot of us aren’t aware of the damage we are doing to our backs. Worse, because we are not educated about the effects our habits have on our backs, we are accustomed to sabotaging ourselves. 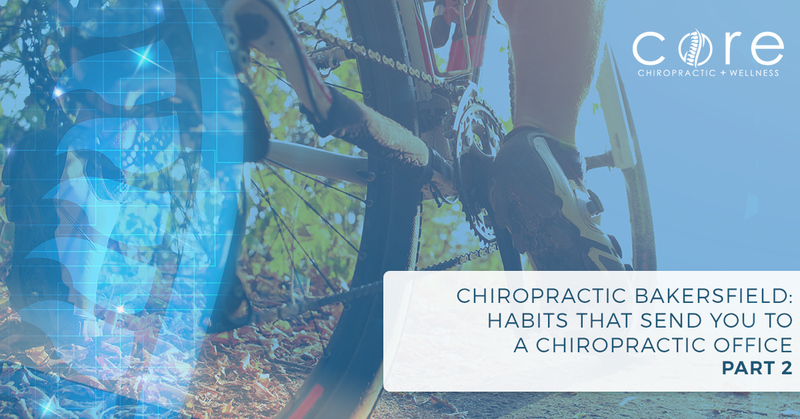 Core Chiropractic and Wellness have compiled this blog series of habits that antagonize your back and can result in future back-related issues. If you find yourself doing these habits routinely, it is best to stop and learn how to improve your back’s health. Posture is learned and habitual. If you learn and continue to carry yourself with bad posture, you will train yourself to continually damage your back. If you slouch often, your body may recognize that position as being “comfortable.” If you continue to slouch throughout your life, correcting your posture later will be almost impossible. Unfortunately, posture is a difficult habit to break, especially if you become used to a poor position. There are methods to improve your posture, such as consciously holding your shoulders back, wearing a brace, or even using unconventional methods to remind yourself to stand up straight. You may have seen in movies how princesses will learn how to stand up straight, carrying a book on their head or tieing themselves to a dinner chair. These methods, albite unusual, can be successful in training your body to adopt a healthy posture. For example, half of learning good posture in consciously remembering to stand up straight. Some methods of improving posture, utilize the idea of memorization as a way to fix the alignment of you back. If you use objects or images to train yourself to cognitively recognize your posture, you could be successful in training yourself. If you make a color, an object, or an image as a reminder, everything you see that designated thing you will stand up straight. Some trainers have used common colors as a method to stand up straight, such as the color green. That way, if you see grass, a green light, or even a green sweater, you will be automatically conditioned to stand up straight. Another great method to improve your posture, as well as relax the tensed muscles in your back, is stretching. Stretches are helpful and will allow you to maintain a healthy balance between muscle health and posture. This art of stretching for mental, physical, and spiritual health is called Yoga. Unfortunately, some people believe that it is a practice reserved for a “specific kind of person.” This assumption is wrong, as everybody, male or female, could benefit from its practice. In fact, a study at the University of Washington found that yoga eases lower back pain faster than any other exercise. But, how could a couple of stretches and rhythmic breathing possibly do that? Only someone who hasn’t yet realized the power of stretching and meditation, would not understand or believe the benefits of Yoga. In truth, stretching and breathing can both improve blood circulation and help calm the body. The key to yoga is that the muscles of the body are being stretched and relaxed in intervals, ultimately strengthening them and relieving pressure. The best part about yoga is that it makes you consciously think about the position of your body and the motion of your breathing. And, you can easily recognize the improvements to your body in a few weeks of practice. If you are curious about the benefits of yoga, it is as easy as signing up for a class. If you are interested, contact your local yoga studio. 30 to 70 percent of bike riders experience some form of upper or lower back pain. However, just because you are experiencing pain while riding, doesn’t necessarily mean that you have to quit all together. For instance, if there is pain while you are riding your bike, it isn’t always your back that is the problem. Adjusting your bike might be the easiest remedy to help you protect your back from aches and pains. So, if you adjust your bike to be one to two inches from your pelvis. However, there is a huge difference between cruiser bikes and mountain bikes. Typically, performance bikes require a distance of about three to six inches. Also, the position of your saddle will also affect the position of your back while riding. For most bikes, it is important to adjust the seat 10 to 15 degrees. How you sit on your saddle will determine how much you back will hurt as well. For example,when riding your bike, you should always sit squarely on the seat and lean over to reach the handles. You also should ride your bike with your knees slightly bent. A good pair of heels improves an outfit, no matter what. Heels are great for elongating your legs, increasing your leg muscles, and building tone in your glutes. Though there are advantages to heels, there are consequences too. For example, wearing heels can cause sores, blisters, and weaken your feet. Worse, they can have long-lasting effects on your back. When you wear heels, you are often at the mercy of your ability to balance your weight. Heels will often force you to arch your back and strain your lower back muscles, in order to sustain your balance. Stilettos can be a trendy shoe and overall amplify your look, but the stress incorporated with wearing high shoes might not be worth the struggle. If you constantly wear high heeled shoes, the stress on your back could become too much to bare. The best way to ensure that you won’t have footwear-related back issues is to wear comfortable soled shoes. You can wear high heels, but it is best to wear them for a short period of time, and sparingly. Half of back issues are from not exercising daily. If you don’t exercise regularly, the added weight on your body can prove to be harmful to your back. But, even if you do workout regularly, you have to be careful how you work so you don’t damage your back. For instance, crunches aren’t always good for the health of your back. Though they are great for your core, they don’t protect your back from harm. More importantly, crunches don’t work the abdominal muscles that stabilize your back. So, this fact can be excellent news for those who despise crunches. There are other ways to work out your core, without straining your back muscles or damaging your spine. In fact, “log positions” are a great way to tone your legs, glutes, and your core — without compromising the health of your back. Sometimes your pride can get in the way of whether you seek out help for your back pain. This is a shame, because there are many resources to utilize that have proven to be helpful in reducing back pain. Don’t suffer through your discomfort just because you have too much pride to ask for help. By going to your local chiropractor, professionals will be able to help work out the knots in your muscles and teach you better ways to treat your back. If you are interested in a chiropractic appointment, contact us today. At Core Chiropractic and Wellness we will be able to handle your back pain and treat it efficiently. So, no matter if your back pain is due to your bad habits, added weight, or stressors, we can relieve some of your pain. Your back is essential to your life, and if you live with soreness, you can miss out on the special moments within your life. Don’t live with upper or lower back pain, get treatment today!